Ever since I saw my girl Taylor post this recipe I have been wanting to make it! It certainly did not disappoint and could not be easier. Now I won't promise you this is as good as Pad Thai from a restaurant because there is nothing better than really good Pad Thai. But this dish is legit, full of flavor and I will most definitely make it again. If you want to save time buy a rotisserie chicken, you could also add shrimp if you want. I actually tripled the sauce- we are sauce people round here. Prepare noodles according to package instructions. Meanwhile, scramble eggs for about 2 minutes and set aside. In a large skillet, combine noodles, chicken, and sauce. 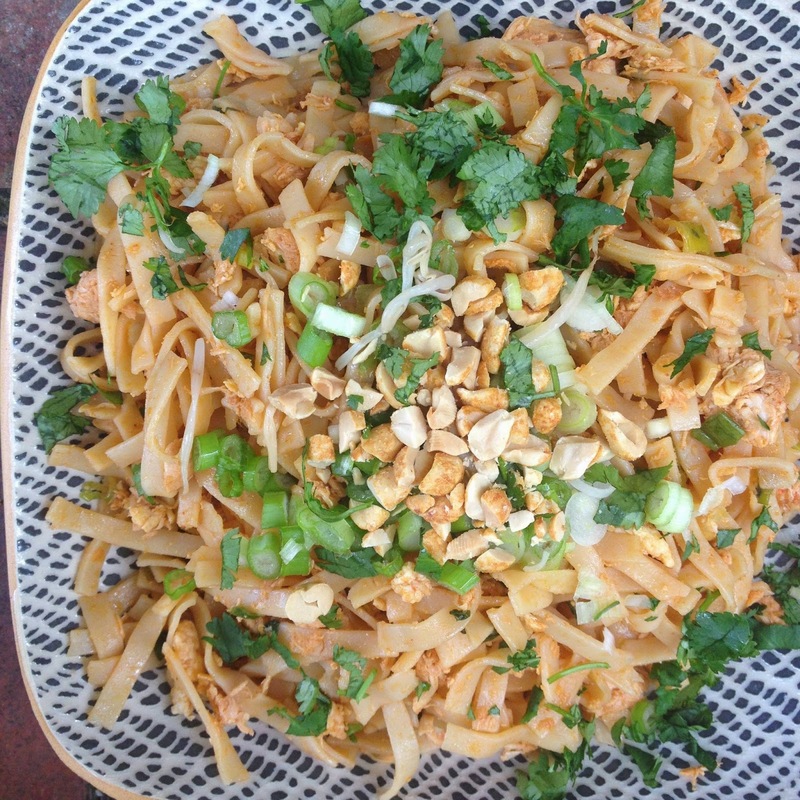 Top with bean sprouts, cilantro, green onion, and peanuts. I've made this exact recipe before and I agree it was so good! It was no Basil Pad Thai but still delicious! This look simple, but yet delicious! I will definitely have to add this to my list of recipes to try out! thanks again so much :) I'm so glad you liked it!!! we mixed up extra sauce too ! I just made something similar (I used tamarind paste in mine though) and used 1/2 rice noodles and a package of broccoli slaw for the rest. It was delicious (and a little better for you). Even my kids ate it! You should try it sometime! The One Jumpsuit You Need.